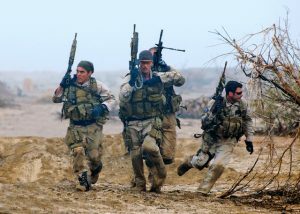 look at the pic of what ,i suppose , are specops.they are bunched up and a belt fed mg would crisp their bacon. this is a violation of basic training tactics. whats so special about special ops ? Because everything the US military has done to date and as far as “assisting” in the fight against ISIS has gone spectacularly well. The definition of insanity? Doing the same thing over and over again, expecting different results. OMG. I just realized. Peter. Whether you know it or not, you have joined the ranks of those journalists before you, who have endeavored to tell the truth,.. no matter what the costs to your self. Walter Cronkite would be proud..notwithstanding Monte Shafer, and many more whom I can’t remember. All I know is.. at this point in time, I trust your journalism more than any I have come across. Which now makes me feel like it’s time for my cynicism to take a back seat to the issues at hand. So, in respect of your continuing efforts to enlighten us poor fools out here.. send me your address via an email so I can send you the best Michigan cult beer I can afford. Don’t never trust nobody is the best motto. As for that beer, please raise it in my name and I’ll do the same in your name with what I’m drinking tonight. Gottcha.. here’s to you Peter. Thanks for your continuing efforts. So you are saying the Libyans shouldn’t get in bed with US. Well, that explains it, The Clintons like to get in bed with everyone but themselves. Speaking of the devil, Hillary and the Donald are in a deadheat in the latest polls. The US voter isn’t as stupid as we thought. There isn’t any difference between the two. Either way we are screwed. 3 AM BS (Bush Shadow) Call on Hellary : Ya also cain’t fashion a silk purse outta a SOW(Sold Out Whore)’s ear, y’hear?! Yup. Thanks to the stupidest, most obedient population on the planet. Just what the .1% like. From a commentor over at emptywheel. And therein lies the seeds of insurrection. It’s only a matter of time. What does that say about US that the two biggest liars are the ones still standing? If Donald is elected, the rest of the world should break diplomatic relations. The US should be relegated to the status of North Korea. If Hillary is elected, the House and Senate will ignore her. DOJ should prosecute her, but that is as likely as Trump releasing his tax returns. Thank god I’m at the end of my time on this planet.